The London Coffee House has a long history of providing a hot cup of coffee, support and socialization to men and women experiencing homelessness, and those at risk. Today, it is located at 371 Hamilton Road in London, and is a program of the Canadian Mental Health Association Middlesex. The Coffee House gratefully acknowledges funding provided by United Way London Middlesex. The new building is a warm, welcoming space for a drink and a snack, to connect with mental health and housing workers, to plan for one’s safety, and to look after basic needs such as laundry. The London Coffee House offers free phone and internet services and has a washroom on site. In addition to talking to a staff member about your housing, health or income related challenges, participants are welcome to join a variety of recreation and leisure activities – from birthday parties to bingo to pet therapy. 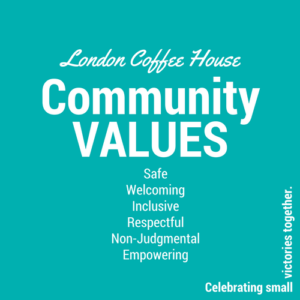 The London Coffee House is an inclusive environment where everyone can join the conversation and the activities. Coffee House participants greatly benefit from your gifts of the following wish list items: bus tickets, $5.00 Tim Horton’s cards, deodorant, tooth brushes and tooth paste, new socks and underwear (for men and women), new hats and mittens/gloves, laundry detergent. The London Coffee House is open 365 days of the year.